A jar of pickles on a wooden table. Pickles can add a satisfying crunch to your garden salad or provide a burst of garlic and vinegar with a sandwich. If you're sensitive to gluten, however, you shouldn't automatically add a pickle or two to your meal without ensuring that this cucumber-based food doesn't contain gluten. 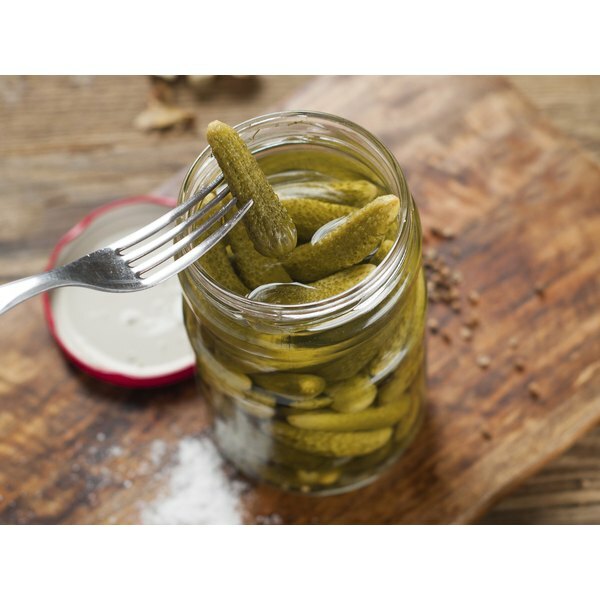 Unlike obvious sources of gluten, such as pasta and bread, it's occasionally possible for pickles to surprise you by containing a gluten ingredient. "Gluten-Free Living" magazine reports that in general, commercial pickles are free of gluten. The magazine notes that pickle manufacturers such as Heinz and Vlasic label their pickles as gluten-free. Heinz, for example, advises that its pickles and relishes are gluten-free. If the pickles you wish to eat contain malt vinegar, however, the pickles contain gluten, notes Huffpost Healthy Living. Barley is one of the ingredients in malt vinegar, and barley contains gluten. Why Did My Pickles Turn Cloudy?